John David Vincent: Consultant after 50 years as an IR test engineer and system engineer (SBRC, Amber Engineering, Raytheon Infrared Operations, FLIR-Indigo). His interests include uncertainty analysis, radiometrics, data analysis and presentation. Mark Stegall and Greg Pierce. (Founder and CEO respectively SE-IR Corporation, Goleta, CA) have designed and produced test electronics for FPA evaluation and imaging demonstrations for over 25 years. BOOK REVIEW Selection of books for review is based on the editor's opinions regarding possible reader interest and on the availability of the book to the editor. Occasional selections may include books on topics somewhat peripheral to the subject matter ordinarily considered acceptable. 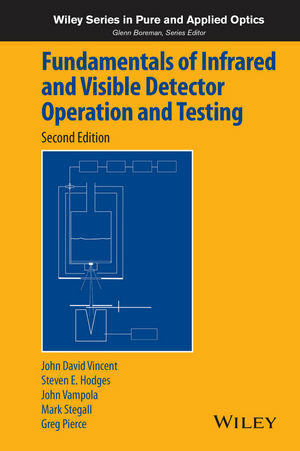 Fundamentals of Infrared Detector Operation and Testing Author John David Vincent Publisher John Wiley & Sons, Inc. Price $54.95 Reviewer M. Alfred Akerman I thought that I already had all the books that I needed in the infrared detector category when this one arrived. After all, how many such books does one need when one's day to-day work deals with optical materials development, not infrared detection? Both major sections of the book are slow starting, so do not plan to make this bedtime reading. Much of the book consists of tables and references, so do not think that it can be read straight through and everything there is to know will be learned. Consider the major headings of the contents of the book. There are two major units: "Detectors and Detector Operation" and "Related Skills." The first unit deals with fundamentals, detector types and operation, radiometry, test sets, and detector testing. What makes the book easy to use is that there is an introduction to each subject, followed by more detail. As an example, under "Detector Operation," major components of a detector are identified and their use explained in a single sentence. Subsequent sections go into increasing detail about each component. One need not read an entire chapter to find out what one wants to know. The second unit has the following major parts: science and measurements, cryogenics, vacuum practices, optics and optical materials, and electronics. In many respects, it is this second part of the book that is the most intriguing. The technology covered in these sections applies to many more areas than infrared detectors. I happened to have the book in my briefcase when I went out of town for a few days to do an acceptance test at a factory. The machine under test failed to cool a sample to liquid helium temperatures in a reasonable time. Was the reason excessive radiative heat transfer, inadequate conductive thermal transfer, or not enough liquid helium passing through the cooling lines? I thought about it awhile, gave up when I saw how many constants I was lacking, and decided to do something more productive, like reading the book I was supposed to be reviewing. Having noted a section on cyrogenics, I flipped a few pages, and there was everything that I needed to solve the aforementioned problem. The next day I walked into the factory with an extra spring in my step because there was no longer any doubt that the problem was due to thermal resistance between different parts of the cooling mechanism. There was plenty of information in the book to solve the problem and plenty of explanation so that a neophyte could be confident that it was being used correctly. In virtually every section of this book, one finds similar combinations of data and equations that are not found in any other single reference. These provide useful insight into problems encountered in everyday work. In fact, Vincent emphasizes that his text is a compilation of notes, derivations, and summaries of articles from the literature and excerpts of sections from books such as that by Dereniak and Crowe1 and that by Wolfe and Zissis.2 In addition, sizable bibliographies are provided. Reference 1 covers detection of light of all wavelengths and goes into some of the state-of-the-art configurations in which detectors are used. There is a set of problems at the end of each chapter that make Ref. 1 suitable as a textbook. Reference 2 is an excellent source book for anyone seriously pursuing the infrared art. It goes beyond the tutorial format and includes charts, tables, manufacturers of equipment, and specifications. While Vincent has used material from Refs. 1 and 2, he has not covered everything, and readers seeking more depth or breadth may want Refs. 1 and 2 as well. Books by Verdeyen3 and Yariv4 are useful because of the great number of subjects that they cover. These two books cover light sources as well as detectors and provide a very good brief introduction to the subject. They, too, include selected problems at the end of each chapter. Everyone knows that one cannot judge a book by its cover. It is equally true that one cannot judge a book by the dust jacket. After reading just a few words of the jacket, I found the word "radioactive" where Vincent's editor probably meant "radiative." This really changes the meaning, but the book itself appears free of such errors. A different kind of error appears in a section on graphing: "Selection of the scale is not as easy as one might think, 509 FUSION TECHNOLOGY VOL. 20 DEC. 1991 since several objectives should be satisfied. This may not be feasible, in which case you will need to make compromises." This kind of description slows one down but does not take away from the overall usefulness of the book. In general, the book is written and indexed so that one can turn to a particular section and learn what is needed without much shuffling and page turning. There is enough material in the book to make it useful not only to a graduate student delving deeply into the lore of infrared but also to a person in a related field who just needs to be reminded of a fact here and there that he once knew but forgot. There are problems at the end of each chapter for those who want to see if they really understand the material. Unfortunately, the answers are not in the back of the book! For fusion research, virtually every subject covered in the book will have an application, although the words "fusion" and "plasma" do not appear in the table of contents or in the index. The material is organized in such a way that one can pick what is needed to solve a problem with a detector, or use a detector, or design arid build a detector. It just happens that many of the technology areas covered also apply to experimental fusion research; for instance, infrared detection, radiometry, cryogenics, vacuum practices, optics, and electronics. In conclusion, the book is well written and provides enough data tables to be relatively self-contained. It is the size of a standard textbook and can easily be thrown into a briefcase for use during a quiet evening at home or to solve an unexpected problem on a trip. Any person doing physical sciences experimentation or building missiles in an aerospace company would find use for this book. I am now thoroughly convinced that I do need another book in this category, and this is the book. M. Alfred Akerman is the technical director of the Advanced Optics Program at Oak Ridge National Laboratory.